What do you do when you find yourself struggling to write even the most basic of code having been using Resharper with VS2010 and you really don’t want to spend any money on a license? Just a small update with a random effect I created based on my particle engine. A fiddle of the effect is here. Having just finished a basic particle engine I thought I would quickly use this as a basis to make a smoke / fog effect. Features I plan to do as enhancements for by basic particle engine. Please add comments / vote on what you would like to see in the comments. After recently searching for a way to do this and finding nothing I thought I would share a solution. It involves using the ever useful AddHandler method on the UIElement you wish to detect the mouse down on and simply setting a flag. Job done. It is worth noting that popups and child windows may appear on top of the UIElement which the handler is attached to. Recently I have been thinking about applications with data input and the problems of being in a browser. One of the perils of being in a browser is that a user may have some unsaved data input tasks. The data can be easily lost by accidently navigating to a different webpage, closing the browser or closing the tab. 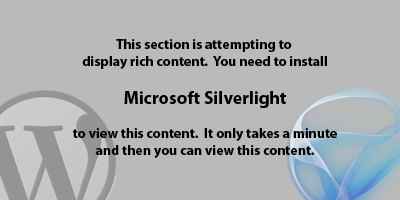 This is a port of a shader I wrote a long time ago at University to Silverlight. It was originally written it Direct X and C++. I am not going to go into too much detail about the implementation but will mention key points I came across. Often when creating an application you will want a secondary mechanism for executing a command, the primary mechanism will often be a button click (e.g. Opening a record). In MVVM the backing ViewModel will expose an ICommand which is bound to the Button’s Command. This behavior executes the same command when a double click occurs. Register to the Mouse Up event on the AssociatedObject, we use the Mouse Up event so that we can attach the behavior to DataGrid / ListBox templates as the Mouse Down events are swallowed by these. Set up a DispatcherTimer with the desired interval, also attach the Tick event and stop the timer. When Mouse Up occurs event occurs the first time we start the DispatcherTimer. For a double click to occur the Mouse Up event must be raised while the timer is active, if it is then we execute the Command and stop the timer. // If the timer is not already running then start it. // If the timer is active there has been a second event so execute the command.